Hayabusa started descending at 9:00pm on Nov. 19th, 2005 (JST) from 1km in altitude. The guidance and navigation during the process of approach was operated normally, and at 4:33am on Nov. 20th, the last approach of vertical descent was commanded from ground, of which soft-landing was successfully achieved almost on the designated landing site of the surface. Deviation from the target point is now under investigation but presumed within a margin of 30m. The approaching trajectories in the quasi-inertial coordinate system and Itokawa-fixed coordinate system are shown in Data-1. 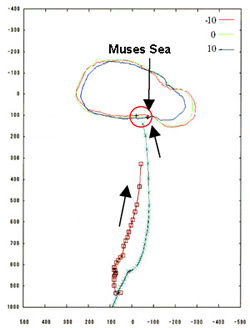 Information on the altitude and its rate during the descent as measured by Doppler data is shown in Data-2. The velocity at the time of starting descent was 12cm/sec. At the altitude 54m at 5:28am, wire-cutting of target marker was commanded, after which, at 5:30am at altitude 40m, the spacecraft autonomously reduced its own speed by 9cm/sec to have substantially separated the target marker. It means that Hayabusa's speed became 3 cm/sec. Separation and freefall of the marker was confirmed from the image (Data-3) as well as from descending velocity of the spacecraft at the time of reducing the speed. The marker is presumed to have landed on southwest (upper right on the image) of MUSES Sea. Since then, checking of the onboard instruments was not possible on a real time basis (as scheduled), but as a result of analyzing the data recorded onboard and sent back to the earth in the past two days, Hayabusa seemed to have autonomously judged to abort descending and attempted emergency ascent because its Fan Beam sensors for obstacle checking detected some kind of catch-light. Allowable margin is set for Hayabusa for its attitude control, in the case the spacecraft takes off the ground by accelerating the velocity on its own. Under such circumstances, the then spacecraft's attitude was out of the margin, because of which continuing of safe descent was consequently chosen. As a result, Hayabusa did not activate its Touch Down Sensor function. At the timepoint of Nov. 21, Hayabusa was judged not to have landed on the surface. According to the replayed data, however, it was confirmed that Hayabusa stayed on Itokawa by keeping contact with the surface for about 30 minutes after having softly bounced twice before settling. This can be verified by the data history of LRF and also by attitude control record (Data-4). After departure from the asteroid by ground command, Hayabusa moved into safe mode due to the unsteady communication line and the conflict with onboard controlling and computing priority. The comeback from safety mode to normal 3-axis control mode needed full two days of Nov. 21 and 22. Owing to this reason, replaying of the data recorded on 20th is still midway, which means the possibility to reveal much more new information through further analysis of the data. As of now, the detailed image of the landing site to know its exact location has not been processed yet. Hayabusa is now on the way to fly over to the position to enable landing and sampling sequence again. It's not certain yet if or not descent operation will be able to carry out from the night of Nov. 25 (JST). We will announce our schedule in the evening of Nov. 24. Figures below indicate approaching trajectory of Hayabusa at descending and landing on Nov. 20th. Fig. 1a describes the trajectory in quasi-inertial coordinate system with z-axis (bottom of fig.) directed toward the earth. Fig. 1b describes the trajectory as against the Itokawa-fixed coordinate system. The trajectory plan was altered according to the occasion during its operation but it is clear from the figure that actual flight route was very close to the one planned in advance. Fig. 1a: Actual descending trajectory as compared to the scheduled plan. Fig. 1b: Actual descending trajectory as compared to the scheduled plan. Fig. 1c is to comply with fig. 1a to show actual trajectory overlapped on alternated trajectory plan subject to changes from time to time according to the occasional situation. Each dot indicates the location of the spacecraft presumed on ground from the surface shapes by processing the compressed image data occasionally. Figures show that guidance was carried out almost according to the scheduled trajectory. From further up in altitude, the dotted locations presumed from the surface shapes vary with discrepancy but from below 1km sufficiently reliable information is obtained. The figure shows that the spacecraft was precisely guided according to re-scheduled trajectory plan. (Data 2): Data history of descending altitudes to Itokawa and its descending rate. Fig. 2a is the Doppler velocity history measured at Usuda and DSN stations, which roughly indicates the descending velocity of Hayabusa to Itokawa. The figure shows that the velocity of Hayabusa at the start of vertical descent was about 12cm/sec. and that the spacecraft reduced its speed autonomously controlling the velocity accelerated by the gravity of the asteroid. Fig. 2b shows the updated altitude information at the right timing that was presumed from the surface conditions by integrating Doppler velocity information. The figure indicates the approximate altitude from the center of the asteroid mass. 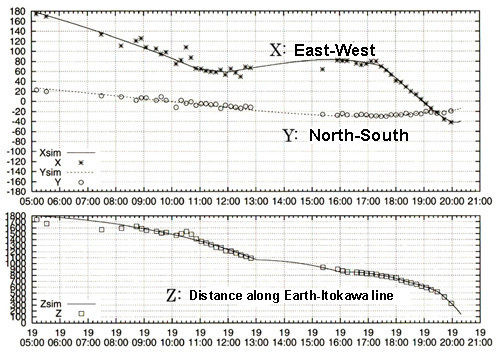 The dotted green line in the figure indicates the altitudes from the surface of ITOKAWA measured by laser altimeter. We can roughly understand the situation of each event at the time of happening by referring to both data of laser altimeter and Doppler velocity information. (or distance history from the center of the asteroid mass). The increase in Doppler velocity at 5:40am (JST) (21:40 world time) is because of landing on the surface of Itokawa as further explained below. 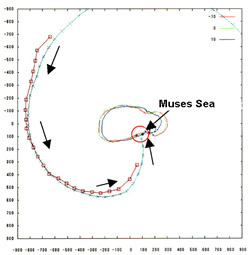 From then on, tracking was switched to Usuda station, because of which we could not obtain Doppler velocity information for a while but the movement of the spacecraft was partly known from LRF, of which data has been partly analyzed as to the later movement of the spacecraft. (Data 3) Target marker with 880,000 names separated from Hayabusa and tracking from aboard. The target marker was released from the spacecraft at the relative velocity of 9cm/sec. The delivery location is southwest of (right under in fig. 3) MUSES Sea. The target marker was designed to reduce bouncing rate by appropriately filling up the inside of aluminum sphere with fine pellets made of high-polymer materials to induce multiple collisions inside to increase consumption of energy. The marker was developed through repeated tests conducted on ground as well as in a non-gravity vacuum tube to prove its low repulsion. According to the distance information data, after self-adjusting movement toward the surface at altitude 17m, moving slightly upward was observed, after which Hayabusa kept freefall by gravity as scheduled to have landed on the surface at almost zero altitude around 6:10 (JST), which was followed by the second bouncing to have eventually kept the altitude almost at zero for time lapse of about 30 minutes. Figure 4c indicates data history of accumulated time of chemical engine thrusting. From the data, we know that (1) at around 20:40 (WT), 5:40am (JST), (2) around 21:10, 6:10am and (3) around 21:30, 6:30am a big torque force worked on the spacecraft for which balancing chemical engine was forced to operate to compensate it. The above (1) was to comply with topographical alignment but (2) and (3) were caused by landing as known from data history of LRF. From the data information that chemical engine repeated injection at constant frequency toward the specific direction for 30 minutes from 21:40 (WT), 6:40am (JST) to 22:10, 7:10am and measured distance by LRF was small enough and also the attitude was kept at steady angle, we know for sure that Hayabusa steadily maintained the attitude from the time of landing. As chemical engine was programmed to inject 15milli second per a second, when once landed, it could not overpower the gravity for taking off and changing attitude but jut kept injecting as long as allowed. Combined interpretation of fig. 2a and 2b tells us that Hayabusa was standing on the surface still with the attitude kept as it landed. From the data information, its attitude shifting was verified as in accordance with the rotation of the asteroid, and it is presumed that the attitude was kept steady as at landing with the side of ion engine facing approximately eastward of Itokawa (leftward in the fig. 3a).